Historical Marker #2343 commemorates American Airlines flight #383, which crashed in Boone County on November 8, 1965, as it was landing at the Greater Cincinnati Airport in Constance. 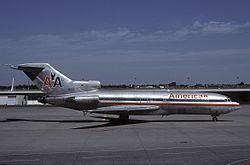 American Airlines flight 383, a Boeing 727, N1996, was a non-stop flight from LaGuardia Airport (New York) to the Greater Cincinnati Airport. The airplane departed New York at 5:38 p.m. and was scheduled to arrive in Cincinnati around 7:00 p.m. The plane was flown by Captain Dan Teelin, a veteran pilot who had been with American Airlines for more than ten years, and Captain William J. O’Neil, who was being upgraded to captain on the 727. It was a routine flight. At 6:57 p.m., the flight crew notified Cincinnati that it was on its final approach. The tower notified Captain Teelin that there was rain in the area, and the captain relayed that the visibility was getting bad. The tower told the crew that the runway lights were on high, but the plane crashed into a wooded hillside two miles north of the runway just five seconds later. The plane broke apart and went up in flames. There were two survivors in the front of the plane and two in the back, but the other fifty-eight passengers perished. After the investigation, the CAB’s "probable cause" finding was an indictment of the two pilots and not the airplane. They decided that the accident was caused by "a failure of the crew to properly monitor the altimeters during a visual approach into deteriorating visibility conditions." As a result of this accident, the Greater Cincinnati Airport built a new and safer 7,800-foot east-west runway which opened on April 1, 1967. The airport then proceeded with plans for a $1.2 million extension of the only north-south runway (at the time) to a total of 9,500 feet. The new runway system was able to handle any type of aircraft. Photo of a 727: This is a 727, the same type of plane that crashed in Constance on Nov. 8, 1965. Becky Riddle, “Crash of AA Flight 383,” ExploreKYHistory, accessed April 19, 2019, https://explorekyhistory.ky.gov/items/show/616.